Mushroom Potatoes with Creamy Parmesan and Garlic Sauce - Let the Baking Begin! Creamy Mushroom Potatoes with Parmesan – The recipe you need to make for dinner tonight! You’ll love these bite-size potatoes, smothered in delicious white Parmesan with garlic sauce! The summer is in full swing and our family is taking full advantage of the nice weather. Cooking delicious foods like these Creamy Mushroom Baby Potatoes smothered in white Parmesan and garlic sauce, visiting friends and petting their chickens. 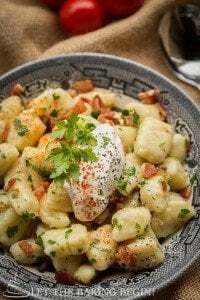 This recipe for baby potatoes in cream sauce is a frequent guest on our dinner table, as they remind me a lot of new potatoes in a cream sauce that my mom used to make for us and always get rave reviews from around the table. Anyway, tell me what you’re up to this summer? What do you enjoy doing when it’s warm and sunny outside? Thoroughly scrub the potatoes and rinse in running water. If using larger potatoes, cut them in half or in 4, to make about 1 – 1.5 inch pieces. Peel garlic cloves. Place the potatoes in a pot and cover with water. Add about 1 tablespoon of salt. Bring to a boil and cook for about 15-20 minutes or until the potatoes are easily pierced with a fork. If using larger sized potatoes that were cut in half or in quarters, add enough salt to make the water a little saltier than soup (let’s say). Also, take care not to overcook, so the potatoes hold shape in the sauce. Drain the water. While the potatoes are cooking, make the cream sauce with mushrooms for the baby potatoes. Wipe down the mushrooms with a wet paper towel. Slice the mushrooms into 1/4 inch slices. Peel & dice the onion. To a skillet add couple tablespoons of olive oil, heat over medium-high heat, add onions and sauté until translucent and slightly browned. Remove to a different plate. Add couple more tablespoons of oil, turn the heat to high and sear the mushrooms, stirring often for a couple of minutes. Next, add the wine and deglaze the skillet by scraping any bits that stuck to it. Cook until all moisture evaporates. Now, add the sauteed onions, cooked potatoes, pressed garlic, heavy cream, salt and pepper, you want to under-season at this point since the Parmesan will add more saltiness in the end. Stir. Taste and adjust the seasoning. Cook for a couple minutes until the heavy cream sauce reduces and coats the potatoes nicely. Add grated Parmesan and stir again. Add chopped parsley, stir again and serve while hot. 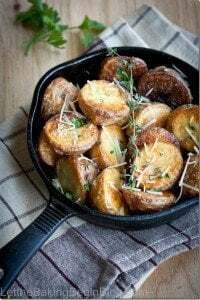 Crispy Roasted Potatoes – Simple crispy potatoes recipe. Fluffy Instant Pot Mashed Potatoes – Creamy mashed potatoes recipe. Parmesan Little Potatoes – The perfect pan-seared potatoes recipe. If using larger sized potatoes that were cut in half or in quarters, add enough salt to make the water a little saltier than soup (lets say). Alsoo, take care not to overcook, so the potatoes hold shape in the sauce. While the potatoes are cooking, wipe down the mushrooms with a wet paper towel. Slice the mushrooms into ¼ inch slices. Peel & dice the onion.To a skillet add couple tablespoons of olive oil, heat over medium high heat, add onions and saute until translucent and slightly browned. Remove to a different plate. Add couple more tablespoons of oil, turn the heat to high and sear the mushrooms, stirring often for a couple minutes. Add the wine to the mushrooms, deglaze the skillet by scraping any bits that stuck to it and cook until all moisture evaporates. Add the sauteed onions, cooked potatoes, pressed garlic, heavy cream, salt and pepper, you want to under-season at this point since the Parmesan will add more saltiness in the end. Stir. Taste and adjust the seasoning. Cook for a couple minutes until the heavy cream sauce reduces and coats the potatoes nicely. Add grated Parmesan and stir again. Made this before and served them with grilled chicken and a ceaser salad they were delicious. 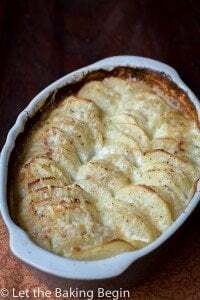 Was wondering if I were to double this recipe for a big crowd do you think there would be a difference in taste if I made the sauce and then just poured it over the potatoes or maybe put them in the oven for a few minutes? Don’t have a big enough skillet for such a big amount. What do you recommend? If making for a big crowd then yes, it’s fine to put the boiled potatoes in the baking dish and then pour the sauce over and stir. You can bake it together in the oven for a couple of minutes to just to thicken up the sauce and make sure to stir too, you want the potatoes to be coated with the sauce and not just to pool at the bottom. Hope this helps! I likeed your side dish potatoes and i need your some vegetables side dish for about lunch or dinner. 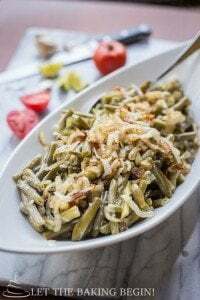 Check this SIDE DISHES section on the blog for my selection. It was not in the printed version, looked at top ingredient list and it is there. How much heavy cream? Does not say. Just enough to coat the mushrooms and create a little bit of a sauce. Recipe looks amazing. However, I don’t use alcohol of any kind. 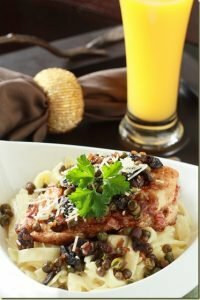 What can I substitute for it in this recipe? Vegetable broth, water? Hi Debbie, you can substitute it with broth or even water. Chicken or vegetable broth will give you more flavor though. Made these potatoes last night and it was a big hit for my family! Thank you for yummylicous recipes. May God bless you and your beautiful family! Made these potatoes for dinner tonight and I must say they were absolutely delicious! These will definitely be on repeat at my house! hi i love your blog but i was hoping maybe you can put up a BREAD & BUTTERED PICKLES CANNED RECIPE this summer? that be so awesome i always visit your blog & i even have my own binder printed of some of your recipes. especially the russian ones =). Hi Lily, thanks for your sweet comment! To be honest I have only had the bread and buttered pickles from the store and have not made them myself so unless I try someone else’s recipe this summer and really like it, I am probably not going to post one. Nevertheless, if you like the naturally fermented pickles that are crunchy and just absolutely delicious, you should try this recipe here that I posted last year. This is the recipe I use to make pickles every year and they’re always a hit. In fact last year I canned 25 lbs and ate them within couple of months so I had no pickles for the winter lol, they were so good. ok i understand =). thank you for your response & your welcome because your blog is under my favorites in my browser. your website is awesome. but i will take your advice & try out the recipe you just suggested. thank you again! 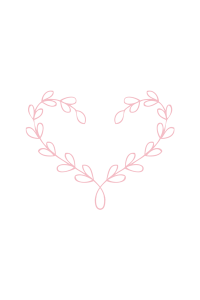 I wanted to say thank you for sharing your beautiful girls with us. They are so happy!!!! My daughter too wants a pet but we live in a rental so we “borrow” neighbors dogs to play and walk. Recently, we were invited to this lady’s house and her cat had 8 kittens. Twice, we drove 45 min one way so that she could play 30 minutes with the kittens. They are a lot of fun! Kittens or anything small is always a lot of fun for kids. My daughters have been asking to go back to pet the kittens as well, and our relative also lives outside the city, so it would be about 30-40 minute commute, but I think we might just have to go there before they grow up. As always you come up with the most amazing recipes! Thank you for taking your time to share with us your amazing creations! You asked what we are doing this summer. Well, this summer, I enrolled my 6-year old daughter in a day camp from 1-5pm. In the morning we do devotional (read a short Christian story about a missionary / Christian kids) and Pray. Then, we eat and I do writing and math with her. My friend works at the Public School in NY and she said that there has been a study that shows that kids learn 40% of what they know in the Summer. So, I thought that I’ll take the full advantage of this Summer and see for myself. After that my daughter goes to the camp where they play outside for the full 4 hours. After she comes home, we eat and go to the park to swim or just go to the Splash Park that has sprinkles. We see families who’s kids are in a wheel chair have so much fun in the Splash Park. Usually older sibling pushes the wheelchair and the kids just laugh and have so much fun! Then,we come home, take a shower, relax, eat, color or cook. Then, my daughter reads, we pray and go to sleep. When we get an invitation to come to somebodies house to visit, we’ll schedule during the weekend or skip camp. Although, its seems like a low key, we like it, since my daughter and I have been sick 6 out of 7 months this year. Once again thanks for visiting my blog and sharing about your summer Tanya! Love seeing pictures of your kiddos! They are beautiful! Thanks for an amaizing recipe!! Will be making it this weekend! Ooh and beautiful girls you have there:)..
Should be called perfection on a plate. Love, love, love.